Traveling With Your Toddler | Super Stay At Home Mommy! We got back from our road trip to Missouri late Thursday night, and I learned a LOT about traveling with a toddler. I’d like to share a few things with you in the hopes that your future travels with a little one will be successful! Bring a portable DVD player- This one was HUGE for us. Linnaea doesn’t typically watch a ton of TV, but the DVD player and her favorite movie was a life saver for us. It really helped distract her from the fact that she had to sit in her car seat for 14 hours. Bring Snacks- I kept a supply of Linnaea’s favorite snacks in the front seat with me, that way I could hand her things as we were driving. Bring your little one’s favorite lovey- Linnaea is attached to her blankie. It’s SO important to grab whatever toy/stuffed animal/pacifier/etc that your child is attached to. 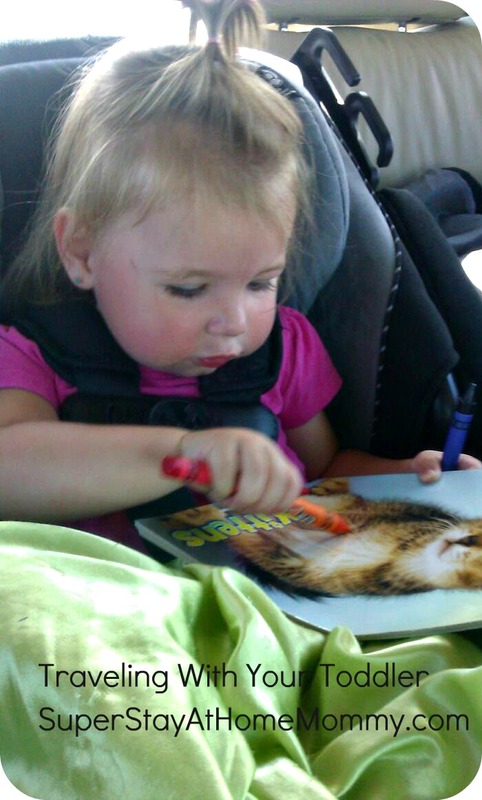 Coloring books- To keep things clean, I handed Linnaea a coloring book and would give her a couple crayons at a time. I switched out colors occasionally, and she was happy as could be. Stop to stretch often- Your toddler will be much happier if you let them stretch their legs often. We stopped at several rest stops along the way and took short walks with Linnaea. Bring along new/different toys- We were able to borrow a few toys from a friend, and these were a huge hit! Linnaea showed interest in them longer because they weren’t the same old toys that she’s used to playing with daily. Bring a small stash of medicines- Tylenol/allergy meds/band-aids/etc…. We learned this one the hard way. When we got to Missouri, it turned out Linnaea was teething and we had to go find teething meds. It would have saved us some hassle if we would have packed a few items. Change of clothes- Put a change of clothes in the car. Linnaea got car sick along the way and we were left digging through the trunk for her clothes. It would have been much easier had a tossed an outfit in the back seat. Diapers- Keep a stash of diapers/wipes/changing pad easily accessible. Or, if your kiddo is potty trained, make sure you are stopping frequently for potty breaks. When to travel- Make sure you are positive that your child will sleep through the night in their car seat before deciding to travel at night. We thought night travel would be easiest because we assumed Linnaea would sleep the whole way. Boy were we wrong. She only slept one hour the entire way to Missouri. That made for a rough first day there. On the way home, we traveled during the day and she did MUCH better. I hope you’ll find a few of these tips helpful! And, please, let me know if you have more to add!! Happy travels!